Back at it after our week in Okinawa. The heat followed us; today's its hovering around the high-90s, and I called it quits at noon, the first Saturday in four weeks we only worked a half day. 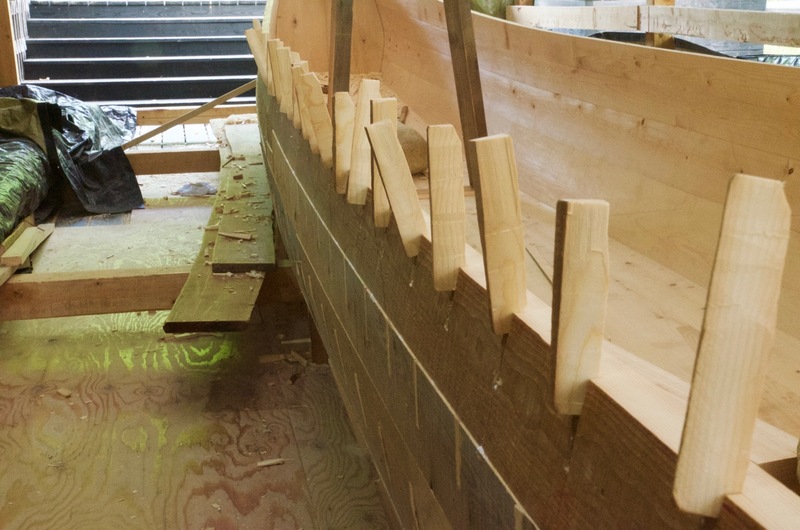 We got the last deck, called the noseude, fitted and fastened, first with glue and then nails. We left the bottom rough so it will be a good habitat for spiders, considered the emissaries of the gods. We had our first spider move in today. 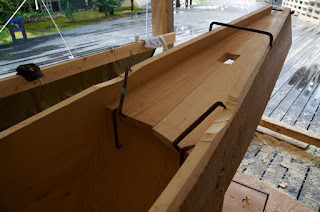 A very tricky angle to drill the hole and drive nails down through the top of the deck and into the transom. My gauge is based on the type Nasu san uses to line things up. 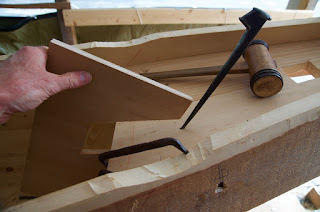 Nasu san quickly roughed out plugs again with his axe, finding the right sized mortise to drop them in so we could glue and hammer them into place. 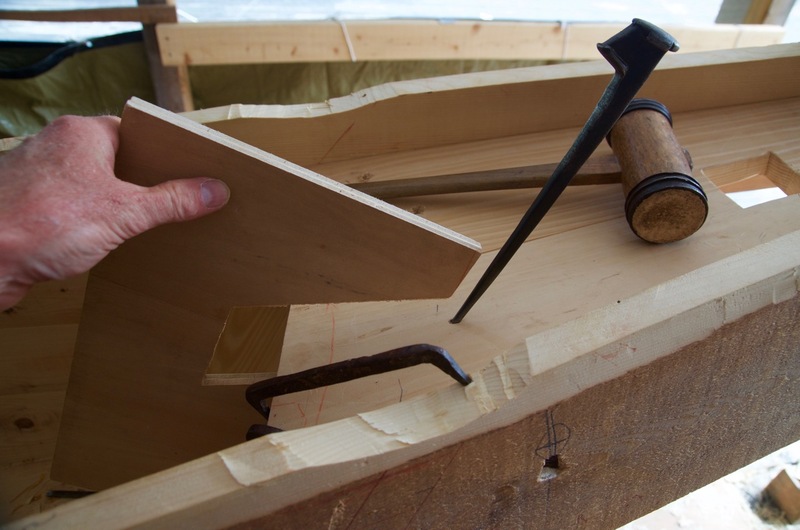 He rejected a box of plugs Masashi san, furniture instructor, machined on the table saw to the proper angle and taper. In truth Nasu san may be able to make them just as quickly with his axe. 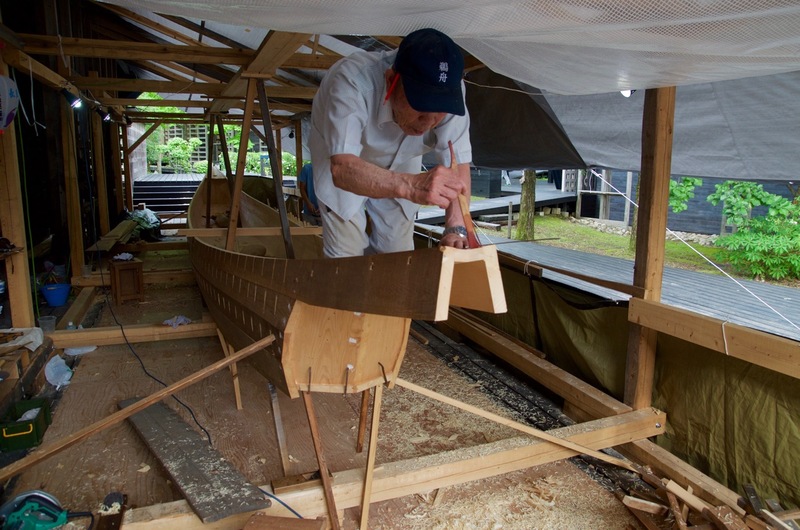 Nasu san on the stern deck marking it for final trimming. Note the shape of the deck end and the supporting plank underneath. 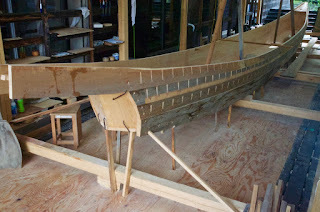 We've rough planed the top two planks with the boat upright, but next we took the stones out and removed the props. 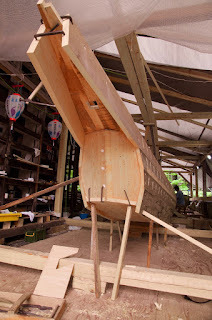 The first job after rolling the boat on its side was to plane the rest of the outside of the hull, first rough planing and then finish planing, all by hand. We revealed just two nails, which we ground down with a grinder and will fill with putty. Nasu san uses regular window glazers putty on his boats. 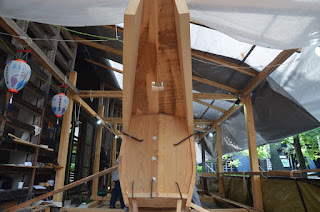 We were also able to put six nails through the bottom and into each transom. We also trimmed the bottom edge of the planking, first using an adze, then an electric plane, then finally hand planes. After this shot was taken we rolled the boat on the other side and finished planing the hull.